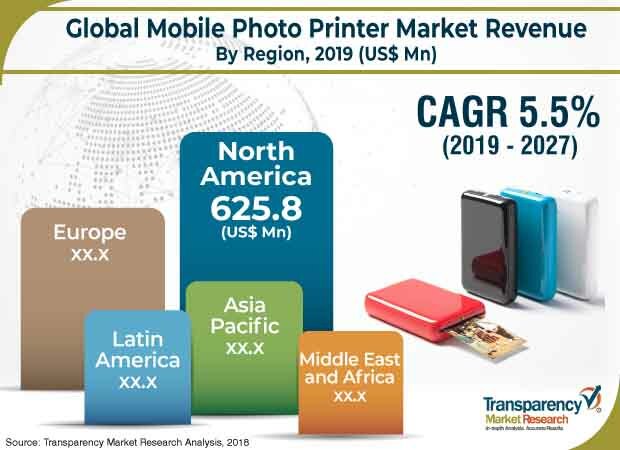 According to a new market report published by Transparency Market Research titled ‘Mobile Photo Printer Market – Global Industry Analysis, Size, Share, Growth, Trends, and Forecast, 2019–2027,’ the global mobile photo printer market is expected to reach US$ 2,922.0 Mn by 2027, expanding at a CAGR of 5..5% from 2019 to 2027. North America held a significant share in the mobile photo printer market in 2017. The global mobile photo printer market is projected to expand due to dynamic aspects such as increase in penetration of smart devices and growth in the tourism industry. However, the market is facing a challenge from the presence of substitutes. Nevertheless, investment in research and development to make innovative products is likely to offer attractive opportunities to the market. Increasing preference for zero ink technology paper has led to the increase in demand for mobile photo printers. Smudge free print, water resistance, and tear resistance are advantages of using mobile photo printers. In terms of product type, the compact photo printer segment constitutes a dominant share of the global mobile photo printer market. This is due to preference of people to carry small sized mobile photo printers. Pocket size photo printer is easy to carry and fits into the pocket of jeans and trousers. Based on connectivity, the Wi-Fi connectivity segment constitutes a share of over 42% of the global mobile photo printer market. In terms of ink usage, ink based mobile photo printer dominates the market due to its ability to print more photos at less cost as compared to ink less photo printers. In terms of application, the individual segment dominates the market due to extensive use of photo printers for self-use. Based on distribution channel, the offline channel dominates the market since consumers want to physically know about the product. The mobile photo is only a decade old and consumers are keen to inspect the product before buying it. Various companies have innovated with the product to ensure a strong presence in the market. This in turn is expected to boost the growth of the mobile photo printer market. In terms of region, North America accounts for dominant share of the mobile photo printer market. North America accounts for more than 33% share of the global mobile photo printer market. It is expected to continue to dominate the market during the forecast period due to high disposable income of the population. The market in the U.S. is likely to expand at a rapid pace. The U.S. constitutes a prominent share of 70% in the mobile photo printer market in North America. Instant photos without connecting to a computer or laptop is the major factor driving growth in the U.S. market. Canada is expected to account for 12% of the mobile photo printer market in North America during the forecast period. China is a dominant country in the mobile photo printer market in Asia Pacific. Chinese companies manufacturing mobile photo printers quote lower price compared to other companies in the market.The market in China is mainly driven by the availability of low-cost mobile photo printers. The market in China is followed by Japan and India in the Asia Pacific region. The market in China is expected to expand at a rapid growth rate during the forecast period due to changing lifestyles and rise in disposable income. GCC is a leading sub-region of the mobile photo printer market in Middle East & Africa. It is estimated to dominate the market during the forecast period. The market in South Africa is expected to be driven by a favorable political environment which is enabling the setting up of more factories and resulting in higher sales of mobile photo printers. Brazil accounts for more than 40% of the mobile photo printer market in South America and is expected to continue to dominate the market in the next few years. The market in Brazil is likely to be driven by acceptance of technological productsby the population. The mobile photo printer market is characterized by the presence of a number of local and regional players and intense competition among them. Some of the industry participants in the mobile photo printer market are Brother International Corporation, Canon Inc., Eastman Kodak Company, Fujifilm Holdings Corporation, HiTi Digital, Inc., LG Electronics, Sony Corporation, The Hewlett-Packard Company, Seiko Epson Corporation, and Polaroid Corporation.